Ulster Bank All Ireland League Div 2B – 01/10/2016. The old cliché of a game of two halves certainly depicted this game between these two Leinster rivals. The weather was perfect for good open rugby. After both teams disappointed in their previous week games, it was an opportunity to kick on and take maximum points. 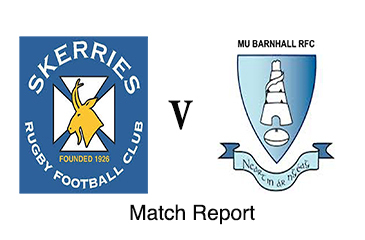 Skerries and Barnhall are two teams that like to run the ball and previous encounters suggested this game would be nothing different and the final score reflected this. Skerries made some changes from the previous week’s selection. Eoin O’Byrne coming in for Conor Roynane in the front row, Thomas O’Hare moving up to second row and Kieran Leonard moving to no 7. In the backs, Paul O’Loghlen made a welcome return while Dara Lowndes made his debut on the right wing. With only one minute into the match, Michael Russell scored the opening try for Barnhall putting five points on the score board for the home side. Skerries were still to find the pace of the game but reacted in spectacular fashion. Some good field position by David Quirke under a high ball, passing back into captain Ross McAuley who evaded a number of Barnhall tackles to score Skerries opener which was duly converted by Paul O’Loghlen to put Skerries ahead, 5-7. Within 5 minutes, Chris Tonge intercepted a pass from the Barnhall scrum half, found himself with an open field, stretched his legs from 40 meters to touch down out. Paul O’Loghlen missing out on the conversion. A penalty was awarded to Barnhall and was kicked over by Simon Gillespie, making the score 8-12 to Skerries. The half time whistle probably came too soon for Skerries. The edge was taking off the momentum Skerries had built up. Within five minutes of the restart, Barnhall drew first blood with a forward worked try to leave the score 24 -15 and back within two scores. Barnhall continued to apply pressure to Skerries using field positions to keep the pressure on the Skerries back three. Skerries defended time after time but some good play by Barnhall ended with a try in the right corner. Conversion was missed to just leave it a one score game 24 -20 to Skerries. Skerries made some changes with Neil Martin making his debut in the from row for O’Byrne, Conn Marrey coming in for Kieran Leonard in the back row, Ruari Woods coming in a scrum half and Maurice McAuley coming in on the wing. Barnhall continued to apply the pressure on Skerries who could not get out of their half. With ten minutes to go, Barnhall got their fourth try, added the conversion to leave Skerries trailing 24-27. This score seem to spark Skerries into action but a number of forced errors handed back Barnhall the initiative to close out the game. The game ended and while the maximum five points was on the table for a long time, Skerries came away with two vital bonus points. This young Skerries team will grow with each game but will need to learn quickly to protect and manage situations they found themselves in on Saturday. Managing the game in situations like this is key to success. Skerries J1’s went down to 18 -5 to Rathdrum in their Metro 4 League game away in Rathdrum.